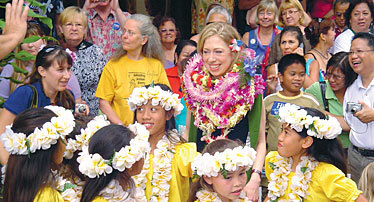 Chelsea Clinton was greeted yesterday on Maui by dancers from Auntie Iola Balubar's Halau. Clinton and other Democratic officials later were called up on stage to dance. Hawaii Democrats who support Barack Obama and Hillary Rodham Clinton ramped up their campaigning this weekend heading into the home stretch before tomorrow's much-hyped presidential preference poll. Obama backers, led by his half sister Maya Soetoro-Ng and U.S. Rep. Neil Abercrombie, gathered at Kapiolani Park, while former first daughter Chelsea Clinton led a rally on Maui for her mother before joining U.S. Sen. Daniel Inouye at another party on Oahu. 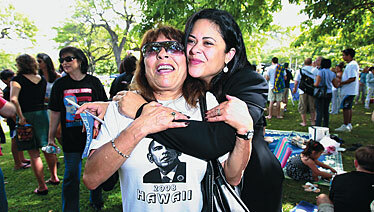 Maya Soetoro-Ng, half sister of Democratic presidential candidate Barack Obama, embraced Obama supporter Rita Spurlock of Waipio yesterday during a rally at Kapiolani Park. The common theme was that this year, more than in any other presidential election year, Hawaii's vote matters. And because of that, supporters of both candidates are aggressively luring voters to the polls. Soetoro-Ng told stories of Obama's childhood here, emphasizing the Hawaii-born candidate's local ties. But Obama supporters were also not to assume that the Hawaii caucuses would be a slam dunk for him. Chelsea Clinton performed a hula onstage on Maui and reminded Valley Isle residents about her mother's effort to improve rural health care and of a visit to Hana. She thanked supporters on two islands before leaving, saying she has a good feeling about Hawaii.